Rattikin Title receives the executed contract and earnest money. Our closing teams open title and order tax information and survey (if needed). Our title plant conducts a property history search that includes review of past owners, liens, lawsuits, divorces or any other variables that could cloud the title. Then, a title commitment is created and forwarded to the closer. 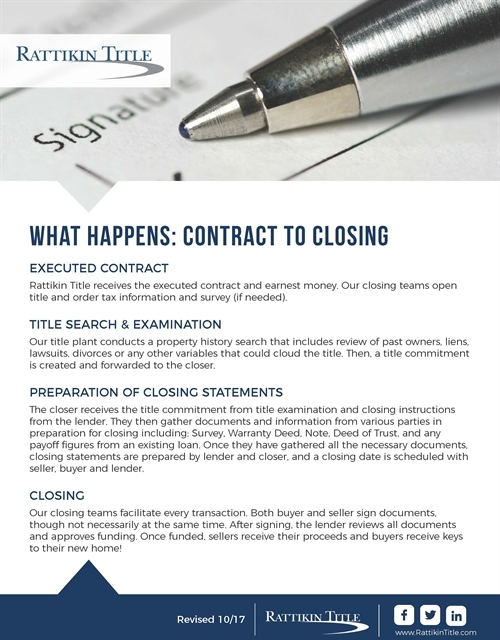 The closer receives the title commitment from title examination and closing instructions from the lender. They then gather documents and information from various parties in preparation for closing including: Survey, Warranty Deed, Note, Deed of Trust, and any payoff figures from an existing loan. Once they have gathered all the necessary documents, closing statements are prepared by lender and closer, and a closing date is scheduled with seller, buyer and lender. Our closing teams facilitate every transaction. Both buyer and seller sign documents, though not necessarily at the same time. After signing, the lender reviews all documents and approves funding. Once funded, sellers receive their proceeds and buyers receive keys to their new home!